Tony Mullins who built a Greenland kayak with me about 3 years ago has been training his grandson Sean in the kayak paddling arts. Sean in the meantime has graduated to fishing guide duties. Here's Sean in the back guiding his customer and uncle, Patrick. 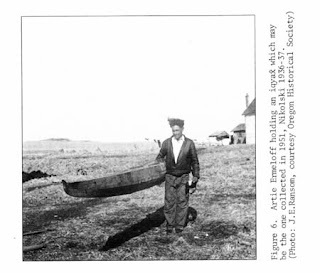 Note that Sean prefers a traditional Aleut paddle for taking the sports out to the prime fishing spots. 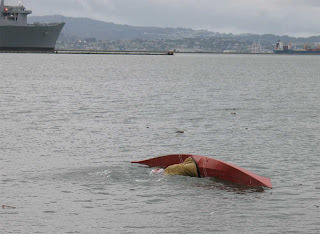 Also in attendance was Sean's cousin Cian in the middle of the boat. Cian is holding the net, ready to land the big ones. 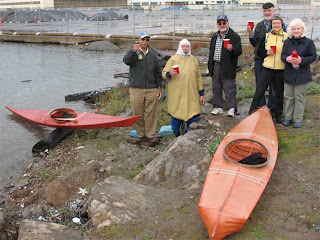 Here we are celebrating the launching of two new kayaks. Tony Mullins was the photographer. Champagne, courtesy of Sidney to the far left. Myself next to him followed by Rouben whose Greenland kayak is at the edge of the water, Don who helped his wife Suzanne in the yellow jacket build the baidarka in the foreground and at the far right, Judy who helped Rouben build his kayak. The tide was about as high as it goes. Another foot or so and the whole place would be under water. It had rained all morning so the actual tryout of the boats was in question. But I donned my gear and did the honors. Balance brace with the Greenland kayak. I am showing this mostly so you can see what the skies looked like that day. 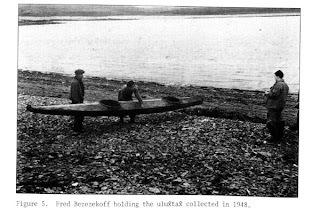 Here's the Greenland kayak in the resting position. Depth is quite low in back. 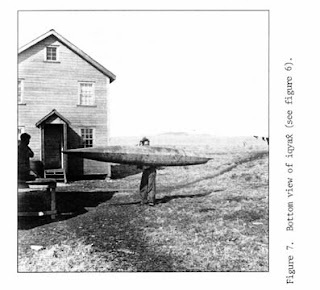 Rouben wanted a boat that was easy to roll and yet would be suitable for paddling in real water. Unfortunately, it was totally flat that day and hard to test the boat in waves. But it felt like a fast boat. Unfortunately I didn't have my GPS along and couldn't do a speed test, but the shore was moving past at a respectable rate and I heard appreciative noises coming from the shore. So I suspect this is a pretty fast boat. Here's the baidarka in the semi-inverted position. Yes, these can be rolled. This boat is 12 foot long and weighs 25 lbs. Here's the baidarka in the upright position. Trim looks good. I widened out the back beyond what I have been doing and this solves the problem of the boats squatting down in back when it gets up to speed. 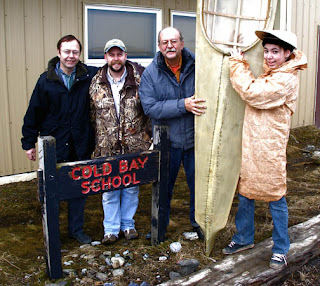 Mike Livingston is active in teaching traditional Aleut culture in Alaskan schools. It's not the only thing he does, but it's one of them. 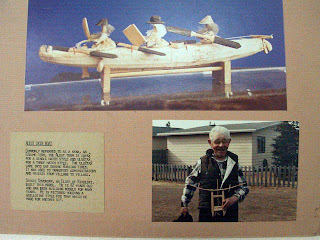 Besides making kayaks, Mike also teaches other skills such as wooden kayak hat construction, drum making, baidarka model making and Aleut language. Here's Mike teaching wooden hat making to students at Aleut Culture Camp in Cold Bay. Mike is from Cold Bay. He went to school there. His dad met his mom here during WWII and decided to stay on after WWII. 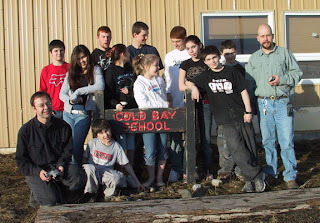 Here's the older students from culture camp at Cold Bay School. Mike is to the far left. Teacher Kurt Schmidt is to the far right. Students came from a number of locations besides Cold Bay, Akutan, Nelson Lagoon and False Pass. Here's a photo taken at the end of Culture Camp with a completed baidarka. From left to right, Mike, Kurt, myself, baidarka, Candace. 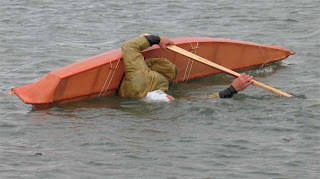 We had to do some prep work ahead of culture camp, but students knocked out three boats in three days. 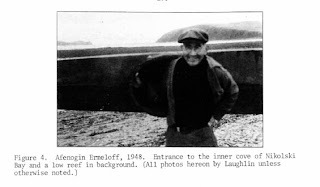 I found some photos of Aleut boat builders/elders and am posting them here as promised. These photos and captions were posted at the school in Akutan, Alaska. 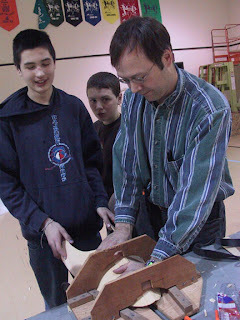 I shot photos of the photos when I was there in about 2004 helping Kurt Schmidt teach baidarka building in shop class. This is a photo of Bill Tcheripanoff ca. 1970. 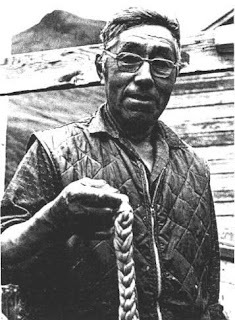 He's holding up a piece of braided seal or sea lion intestine. At the time, Bill was being interviewed by Joelle Robert-Lamblin, a French anthropologist about the topic of baidarkas. Here's another photo of Bill Tcheripanoff about a dozen years after the previous picture was taken. 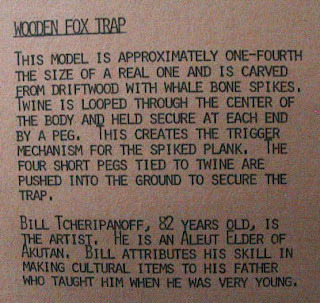 He's holding a fox trap in his lap. Here's the caption that went with the photo. 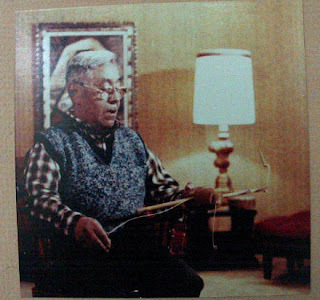 This one is a photo of Sergie Sovoroff and one of the baidarka models that he built. And here's the caption that went with the photo of Sergie. By the way, Mike Livingston studied with Sergie and told me that Sergie's models are in museums all over the place, but never with his name on them. 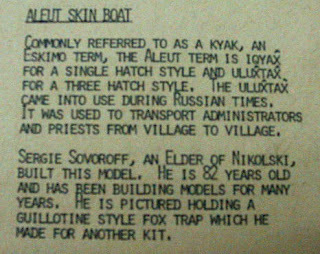 Mike Livingston asked me if I had anything on Aleut elders on my website. I told him no, reason being that I have never had a chance to talk to any of them. 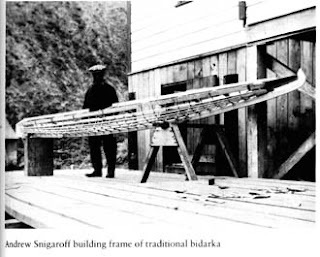 But I told him that I had hoped to put something about Aleut boat builders on my website. This isn't it, but I will be working on it. Stay tuned.